The signs are definitely out there and all we’re waiting for is the curtain to rise. Act 1 When will the lake be ice free? The geese are here, the ducks and few loons are here, and the osprey and the great Blue Herons are flying over head. When will the docks go to their summer homes. Almost everything is hinging on when the ice melts and disappears into the abs. If it doesn’t go out soon we will be hard pressed to open on time. but we are still on track for the week of May 9th. 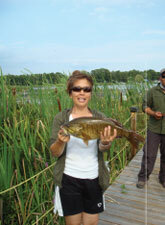 May is a perfect time to catch Black Crappie, Blue Gills and of course perch and mid May Walleye or Pickerel. It’s great time to take advantage of our great spring opening package,Highland View. Act 2 Spring Flowers that the next part. Posted in Uncategorized having Comments Off on It’s a long time coming but Spring is around the corner.